The Carolina Panthers will battle the New Orleans Saints in the Wild Card round of the postseason. PFF previews the top player matchups of this win-or-go-home game. 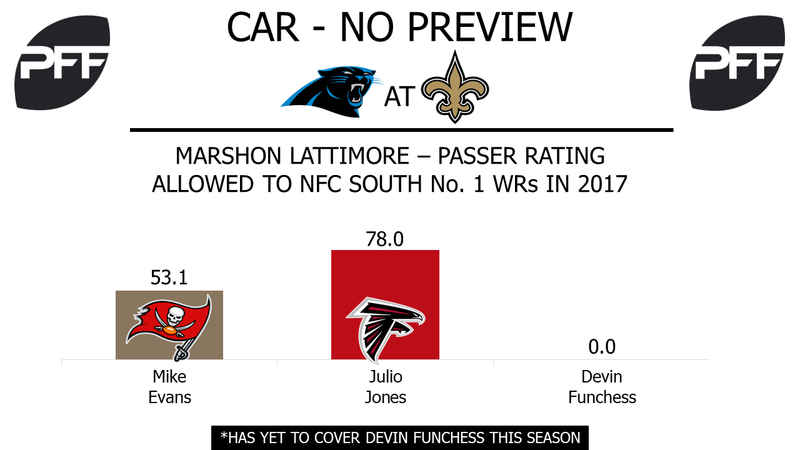 WR Devin Funchess vs. CB Marshon Lattimore – Even though this is the third time the Panthers and Saints will play this season, Lattimore missed the two previous matchups due to injury. So, this will be the first time that Funchess will face the shutdown rookie cornerback. In the two matchups without Lattimore, Funchess was held in check, with a wide receiver rating of 45.5 on a team leading 18 targets. 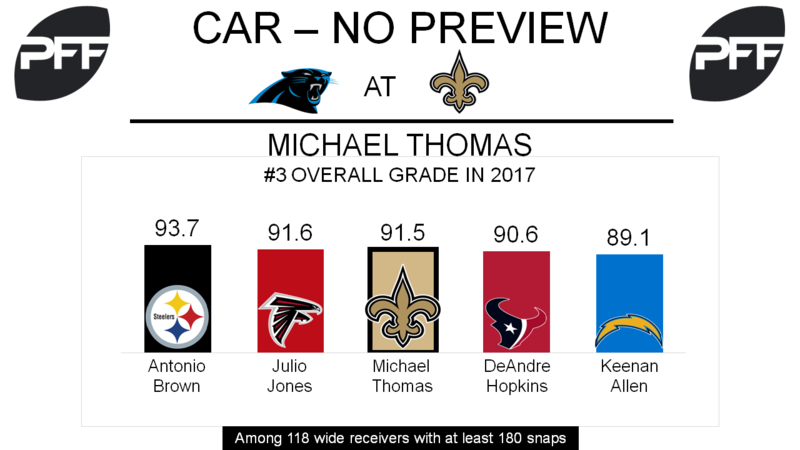 Now the Saints will add the seventh-highest graded cornerback in the league (89.9) to the mix, and to make matters worse, Funchess isn’t quite at full strength, although he is still expected to play. The biggest chance Funchess may have to try to attack the Saints is in the red zone, where he had a passer rating of 117.5 when targeted during the regular season. He scored four times on red-zone targets, fully half of his season total. Lattimore was targeted six times inside the 20-yard line on the entire season, and he only allowed three receptions for five yards and no touchdowns. RB Christian McCaffrey vs. LB Craig Robertson – McCaffrey was the Panthers’ most reliable weapon against the Saints in the first two matchups, leading the team in receptions with 14 and receiving yards with 134. 101 of those receiving yards came in the Week 3 matchup, a game in which McCaffrey earned his highest receiving grade of the season with a 91.0. His 88.9 receiving grade this season was earned on a league leading 106 targets among running backs. After allowing a league worst 120.6 passer rating to the position in 2016, the Saints defense allowed a passer rating of 98.6 this season to running backs. With A.J. Klein on injured reserve, Robertson covered running backs more often than any other Saints defender. He allowed 14 receptions on 19 targets., but only one of those receptions came from McCaffrey. TE Greg Olsen vs. S Vonn Bell – This is another matchup in which one player will be making their season debut in this rivalry, as Olsen missed both games in the regular season due to injury. In his short action, Olsen has been less than stellar, as he only graded out to 72.6 overall this season, a career low. But he has been as dependable as ever for Cam Newton, with zero drops on his 17 catchable passes. The Saints defense was about big plays, for themselves or their opponents, when covering tight ends this season, as they allowed six touchdowns to tight ends and intercepted six passes intended for tight ends on the year. Bell did not allow a touchdown or intercept a pass while covering a tight end, but his 108 yards allowed to the position are the most on the team. WR Michael Thomas vs. CB Daryl Worley – Michael Thomas completed the 2017 regular season with a 91.5 overall grade, No. 3 among 118 qualifying wide receivers. Thomas’ 2.39 yards per route run figure tied for fourth among qualifying wide receivers and he dropped only two passes on 139 targets for a 1.89 drop rate, bested by only two wide receivers with 82-plus targets. He earned the highest game grades among Saints wide receivers in the Week 3 (88.0) and Week 13 (80.6) games against the Panthers. Daryl Worley was in coverage on more of Thomas’ targets than any other Panthers defender between those two games, and he performed quite well in limiting Thomas to three total receptions on five targets for 14 total yards. Worley’s 86.4 overall game grade in his Week 13 matchup against the Saints was his highest of the season. His 59.7 overall grade on the season was 88th out of 120 qualifying cornerbacks however, and his 1.16 yards allowed per cover snap was 61st among 86 qualifying cornerbacks. RB Alvin Kamara vs. S Mike Adams – Alvin Kamara earned the second-highest overall grade (90.6) among qualifying running backs in 2017, and his 3.83 yards after contact per attempt average was also second-best. He’s a big play waiting to happen, as either a runner or receiver. His 41.5 breakaway percentage means he had the fifth-highest percentage of his rushing yards come from runs of 15-plus yards, while his 2.81 yards per route run was the highest figure among 56 running backs with at least 100 snaps in route. Safety Mike Adams is likely to match up with Kamara both as a runner and a receiver. He spent 59.2 percent of his snaps against the run within eight yards of the line of scrimmage at the time of the snap, and on those plays his 5.9 run-stop percentage was 21st among 58 qualifying safeties. He missed as many tackles (four) in 314 snaps against the run as he did in 610 snaps in coverage. T Ryan Ramczyk vs. Edge Julius Peppers – Ryan Ramczyk earned an 80.8 pass-blocking grade on the season, which was the best among rookie tackles and was the 15th-best mark among 87 qualifying tackles. He allowed only three sacks and 24 total pressures on the season on the way to a pass-blocking efficiency rating of 96.6, seventh-best among 55 qualifying tackles. He’ll work to keep Julius Peppers at bay, as Peppers spent 83.7 percent of his pass-rushing snaps on the defensive left side. Peppers’ 8.2 pass-rushing productivity rating ranked 32nd out of 68 qualifying 4-3 defensive ends, and Ramczyk all but shut him down in the teams’ two regular-season matchups, limiting him to just two total hurries on 34 pass-rush snaps, good for a pass-rushing productivity mark of just 4.4.